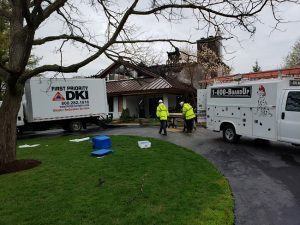 May 4, 2018 – First Priority DKI, a member company of DKI Services, North America’s largest disaster restoration contracting organization, responded to a call yesterday for a 9,000-square-foot home in Barrington Hills that was damaged by a large fire. 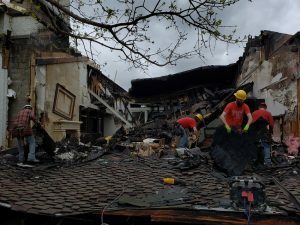 The fire, allegedly caused by lightning, broke out around 3:30 a.m. on Thursday morning. Luckily no one was injured, and with the help of 20 fire departments in the Barrington Countryside Fire Prevention District, the fire was under control within a few hours. However, the home is uninhabitable in its current state. Within an hour of the call, First Priority arrived on scene to assess the damages. The team cleared away the rubble, including a large section of the roof that had fallen into the living room, and will return today and work through the weekend to stabilize the environment. First Priority Owner Rick Becker commented on the response and teamwork he has already witnessed throughout the beginning stages. “I was extremely impressed with the Barrington Fire Department and how well they handled the fire. Families and pets are safe and sound. First Priority DKI feels privileged to be assisting in the restoration efforts,” Becker said. To learn more about First Priority DKI’s disaster restoration services, please visit www.firstprioritydrs.com. Since 1981, the First Priority DKI team has been helping property owners in Chicagoland restore their properties after disasters of all kinds. Their state of the art services include fire damage repair, structural drying, soot/smoke/odor removal and mold remediation. Whatever you need, whatever is right for you, First Priority DKI pledges to handle your projects with compassion, focus and professionalism. To learn more, visit www.firstprioritydrs.com.